The Jacobs Technion-Cornell Institute provides an impressive package valued at $175,000 that includes a salary and housing allowance, a research budget, mentorship, workspace and office equipment on campus, IP registration and use, as well as classes and workshops on entrepreneurship and business management. Runway award: We provide a package valued at $175,000 that includes a salary and housing allowance for the Startup Postdoc, a research budget, IP registration and use, free access to all CBInsight publications, and numerous other benefits. Your research budget can be used as you see fit: To pay employees or consultants or to purchase equipment — it’s up to you. Business education: We kick off the program with “Startup MBA,” a four week intensive education program teaching entrepreneurship and business concepts. We’ll discuss how to identify and evaluate product/market opportunities; develop customers; create a startup strategy and face uncertainty — the list goes on and on. After these initial weeks, you’ll attend entrepreneurship classes including Business for Engineers, Product Management and Startup Studio sessions where you will interact with Cornell Tech MBA, Engineering Master’s and LLM candidates. You’ll also have access to our Studio, the open space where guest practitioners, experts and serial entrepreneurs lead sessions on a variety of aspects of starting a tech company: company culture, pitching and public speaking, fundraising and more. Mentorship: We’ve assembled an amazing team of academic and business mentors who are uniquely suited to help you succeed. In addition, our In Residence practitioners — investors, designers, developers, and entrepreneurs — are available for consultation. Emotional support: Don’t underestimate this benefit. Starting a company can be a lonely business. 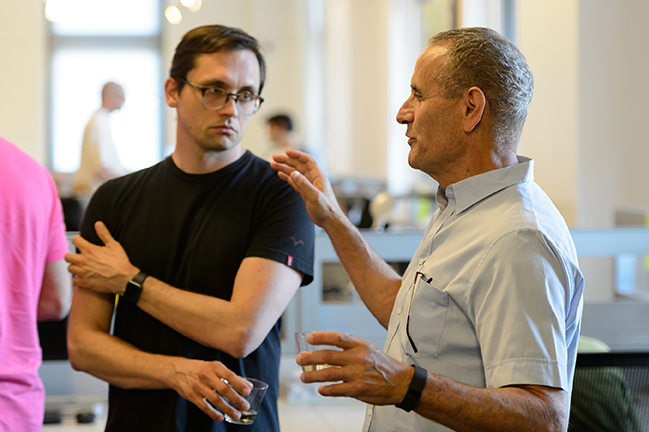 You’ll come to deeply value the camaraderie and relationships that you’ll develop with your fellow Startup Postdocs. Runway includes weekly cohort meetings called Scrums, and monthly social events with inspiring people. There is no place for free riders: you’ll share advice, feedback and resources — and you’ll receive them. Office space and support: Runway will provide a workspace at the Jacobs Technion-Cornell Institute, which is part of the Cornell Tech campus. You will also have access to meeting rooms, office equipment and administrative support. Equipment: You’ll be able to use standard office equipment (computer, printer, etc.) as well as 3-D manufacturing tools including a 3-D printer and laser cutter. Specialized software programs including Sprout by HP will be available. I receive amazing support from the Jacobs Technion-Cornell Institute in terms of resources, connections and knowledge to translate scientific research into products. They are open minded, progressive thinkers who truly want to empower new entrepreneurs. Find answers to your questions about admissions eligibility, coming to Runway from abroad and other commonly asked questions.